A great film about my favorite ladies, A Traffic Controller on Crossroads is newly out with English subtitles on Youtube. In The DPRK the film is described as a romantic comedy, and while through a western perspective I found it neither, the film still provides a unique look into North Korean culture via their domestic film industry. Comrade Kim Goes Flying, the first ever feature film done in collaboration between North Korean and Western producers, will have its world premiere screening this September at the Toronto International Film Festival. Comrade Kim Yong Mi is a North Korean coal miner. Her dream of becoming a trapeze artist is crushed by the arrogant trapeze star Pak Jang Phil who believes miners belong underground and not in the air. A heartwarming story of trying to make the impossible possible. A winning, life-affirming fable about a young coal miner’s pursuit of her dream to become an acrobat, Comrade Kim Goes Flying marks a milestone in film history: it is the first Western-financed fiction feature made entirely in North Korea. But this charming film wears its heavy historical mantle with grace, weaving a lovely, light-hearted tale whose themes — overcoming adversity, and realizing the dream of a lifetime—upend our assumptions of a largely cloistered culture. Kim Yong-mi (Han Jong-sim) works as a coal miner in a small village. She dreams of one day joining the national circus and performing on the trapeze — despite the fact that she is deathly afraid of heights. When she is promoted and sent to the capital, Pyongyang, she seizes the opportunity to make her dream come true. Insinuating herself into the circus and struggling to overcome her acrophobia, Yong-mi meets Pak Jang-phil (Pak Chung-guk), the arrogant, good-looking star of the Pyongyang Trapeze Troupe. At first, Jang-phil makes fun of the congenitally klutzy Yong-mi. But eventually her beauty, endearing personality and unyielding determination win him over, and give him a valuable lesson in humility. The team behind Comrade Kim Goes Flying — co-writer and co-director Nicholas Bonner, an Englishman based in Beijing who has long promoted cultural exchange with North Korea; his collaborator Kim Gwang-hun, a North Korean filmmaker; and Belgian filmmaker Anja Daelemans, who also served as co-producer — spent six years putting this unprecedented project together, overcoming numerous difficulties — not least the fact that their stars are actual circus acrobats who had never acted before. But the result is a gorgeously filmed romantic comedy that transports us to a fantastic world seemingly out of time, with astonishing, candy-coloured images of the seldom-seen North Korea. Comrade Kim Goes Flying will be shown to audiences throughout the DPRK and will present to them provocative scenes the likes of which have never been seen in North Korean cinema. I was given the honor to preview some of these clips, and while international viewers might easily overlook their importance, scenes depicting corruption in the state system and child obesity have been designed to shock domestic North Korean audiences. 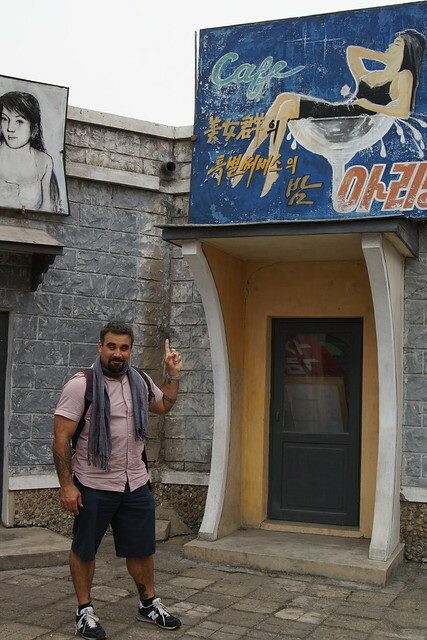 Viewers will also be treated to what producer Nick Bonner describes as the “sexiest scene in North Korean cinema”, an upward shot of Comrade Kim in her leotard climbing a ladder to the trapeze – YAWZA YAWZA! One last interesting aspect of the film I should mention is the delightful animation of the opening credits. The animation during this sequence takes its influence from modern North Korean wood block prints, the style of which can be seen in the promotional picture at the top of this post, and also here in its common form. Photos credit to the official Comrade Kim Goes Flying website.